Creating successful lead generation strategies for your accounting firm can be a frustrating process. In the accounting industry, your services are needed and required, but they also aren’t something that most clients are excited about fitting into the budget. Your potential clients know that competition among accounting firms gives them the upper hand. You need a lead generation approach that not only lands them at your door, but welcomes them inside. Lead generation is important, but it is only half of the equation that equals success. The other half is nurturing those leads, generating conversions and creating clients for life. Now is the time to stop focusing on accumulating leads that go nowhere and start generating the leads that will grow your accounting business. Here’s how. What do your clients see when they land on your page? Is it information about your firm, or is it information about what your firm can do for them? Don’t fall prey to the boring landing page that brags about your firm, but offers little to the client in terms of relatable value. Your landing page should be clean, uncluttered and structured in a way that makes it almost impossible for a new lead to be created. Here are a few tips for structuring a landing page that invites engagement. First, let them know they have landed in the right place. The very top of your landing page should include keywords that indicate who your target audience is along with an attention-grabbing headline. Keep your CTA above the fold. Don’t make your clients read and scroll through a bunch of industry jargon and “why you should” pitching techniques. Position your CTA at the top and make the intent clear. Use bullet points to convey the benefits of receiving your lead magnet. Keep the content engaging, but avoid lengthy paragraphs. How do these simple strategies make the difference between generic leads and leads that stick? Potential clients know exactly what they are signing up for and why. A muddled landing page might get leads because viewers liked the lead magnet, but didn’t take the time to see what your firm can really offer. Straightforward content makes the decision to convert easier for the client. New insights with inbound marketing have created new, exciting ways for businesses to generate leads. Unfortunately, many companies have pushed email marketing to the side or use it ineffectively. You can, and should, be using email to reach out to more than just your existing clients. The key to generating great leads that turn into clients is learning how to take that generic email list and tailor it in a way that personal and directed. When generating email lists, capture information about what specific services your client needs. Segment the email lists into categories based on those needs. Tailor your email campaign to match the individual client needs and tie in your lead magnet in a way that seems beneficial to them at this moment. Provide customized timelines in your emails. For example, a timeline of steps for small businesses to take at year end, or reminders of important filing dates. Don’t wait until it’s too late. Continue to update and send out these emails starting before they really need your services. Add social sharing buttons. When your emails contain valuable content, recipients will want to share on social media. Make it easy for them. Have you heard about H2H marketing? This buzzword, which is replacing B2B and B2C, stands for human to human. We have entered a marketing age where approaching the client on a personal level is becoming more effective that approaching them from a business standpoint. Leads are created when potential clients can relate to you. There is no better method of H2H marketing than social media. Lead generation on social media is all about building trust, respectability and brand loyalty. 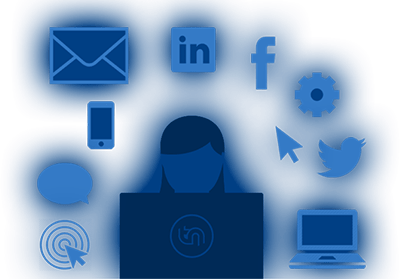 Your accounting firm should be using multiple platforms of social media to share quality content that offers value to your followers. Share offers with your followers that they will want to share with others. The great thing about social media is that your followers will help you generate more leads, when you provide them with quality, value and trust. What you do with leads once you have them is just as important as getting them in the first place. Without proper nurturing, those leads won’t convert to paying clients at the rate you need them to. One of the main mistakes a firm can make is getting lazy once leads have been generated. Here are four things that you should always do with your leads if you want to turn them into paying clients. Nurture a relationship. Each person that subscribes or contacts you should get a follow up within 24 hours. Clients can have a short-term memory when it comes to lead magnets. They may not even remember where they got it from. Following up soon after they have initiated contact plants the seed for a lasting business relationship. Stay on their minds. Don’t be the friend that calls once a year to catch up. Make regular contact with them to let them know how you can be helping them now, even if it is a series of reminders about upcoming filing deadlines or promotions. Realizing that your value to them isn’t limited to just one service, or one time of year will lead to higher conversions. Take a helping hand approach over the hard sell. Nobody likes to feel like they are being targeted for a hard sell, but everyone can use advice and a little guidance. Regularly publish content that is helpful and relevant to the time of year or industry. Gain their trust, and you will be the one they turn to. Don’t forget your existing clients in all these strategies. Word of mouth means a lot, especially in the accounting industry. Continue to nurture your clients and they will help generate even more leads for you. Tax season is here. What are you doing to generate the leads that will turn into paid client relationships? Get on top of your lead generating strategy now and get ready for your most successful year yet.